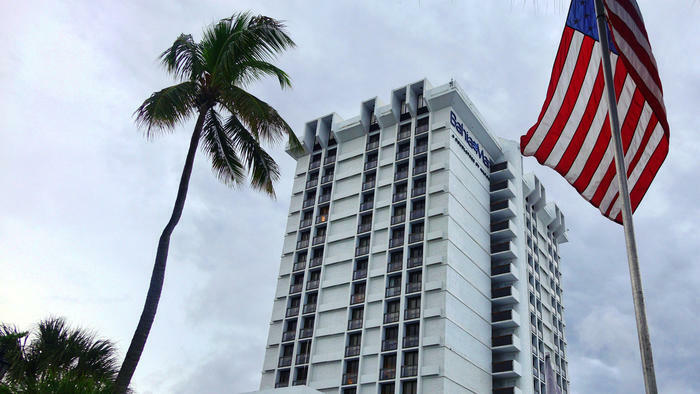 New owners of the Bahia Mar Fort Lauderdale Beach hotel are mulling redevelopment ideas, but there’s one thing they don’t plan to mess with. That’s the significant role the hotel and its marina have played as headquarters sites for the Fort Lauderdale International Boat Show. The Bahia Mar’s yachting center joined the boat show in 1976, and the boating extravaganza expanded to both sides of the center in 1984. “The boat show is our top priority, and we want to make sure whatever we do complements it,” said Kenny Tate, partner at North Miami-based Tate Capital, who, with his brother Jimmy Tate, is part of the resort complex’s majority ownership team. On Tuesday, Tate met with executives of the show’s owner — Marine Industries Association of South Florida — to reiterate that intent and finalize plans for the upcoming show. “While we haven’t seen detailed plans yet, [the new owners] have made strong assurances that they want The Bahia Mar Resort Hotel on Fort Lauderdale Beach, which has been sold again, as seen Thursday, to have a long-term relationship, and the boat show and marine industry will be an integral part of that,” said Phil Purcell, the trade group’s executive director. The 55th edition of the boat show runs Oct. 30 to Nov. 3 at Bahia Mar and six other locations across Fort Lauderdale. The event typically attracts about 100,000 people.